Greg Cote: Howard Schnellenberger deserves to get into College Football Hall of Fame Read more here – Where Kentucky's Greatest Pro Football Players Live!!! 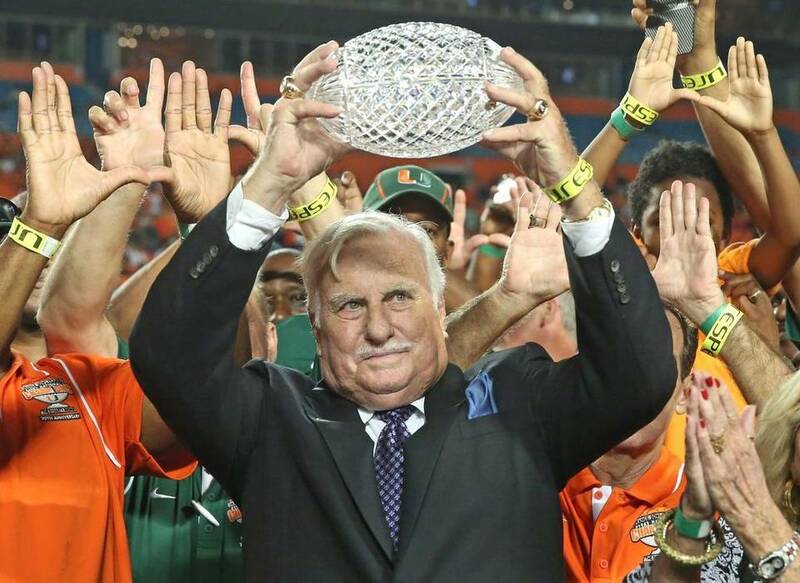 A ballroom full of appreciative admirers and those impacted by Howard Schnellenberger’s epic coaching career will gather Thursday evening in Davie to say thanks in a much deserved “tribute and celebration dinner” put on in his honor by the Miami Touchdown Club. Suffice to say, the folks running the College Football Hall of Fame would not be impressed. See, Schnellenberger isn’t good enough for them. He was good enough to put the University of Miami on the map and kick off a modern dynasty by being the Hurricanes’ first national-championship football coach in 1983. He was good enough soon after to take over a moribund University of Louisville program and turn it around, too, leaving it with a new stadium and a bright future. He was good enough to be the god of football at Florida Atlantic University, the program’s creator, building it from nothing, and leaving it with a great little campus stadium built by his own imagination, perseverance and fundraising acumen. Howard Schnellenberger, now 81, was good enough to be part savior, part hero and a lasting, revered icon at three institutions. He was good enough to win 158 college football games in his career and be a perfect 6-0 in bowl games. And that’s not even getting to his work before becoming a head coach. That included an assistant’s role under the tutelage of Bear Bryant at Alabama, where Schnellenberger was good enough as a recruiter to reel in a couple of quarterbacks named Kenny Stabler and Joe Namath. As player or coach, Schnellenberger devoted 39 years of his life to college football across six decades and would grace the coaching Mount Rushmore of three programs. But he isn’t good enough for the sport’s Atlanta-based Hall of Fame, administered by the National Football Foundation, on account of one stringent rule in its criteria for consideration: That inductees have at least a career .600 winning percentage. Schnellenberger falls short, yes. He lost almost as many games (151) as he won. That can happen to a man’s career ledger when the three programs he turned right — Miami, Louisville and FAU — were nothing (figuratively or literally) before he arrived and it took some time, and rough seasons, to make it all work. He didn’t inherit champions. He took on challenges. He didn’t move into palaces. He took on fixer-uppers … and built them to last. It is appropriate Schnellenberger’s testimonial dinner is on the same day UM conducts its first fall practice, because much of the pressure on current Canes coach Al Golden is on account of the standard Schnellenberger set, the bar he raised. Likewise, every Louisville coach will know who he’s following, just as every FAU coach will know who the father of that program is and always will be. How can there be more than 1,100 players and coaches in this Hall but be no room for Schnellenberger? The College Hall of Fame should make an exception to its 60 percent rule because Schnellenberger is deserving, and also because the rule is arbitrary and unnecessary. I spoke at length about this with Steve Hatchell, president and CEO of the NFF and college Hall. If you think you know the name, he was Orange Bowl Committee executive director from 1987 to ’93. He knows Schnellenberger’s heft and imprint better than most. Hatchell was sympathetic but unbending. Quick background: In 1990 the Hall went “hard and fast,” Hatchell said, on the criteria that coaches admitted must have won at least 100 games and won 60 percent. That rule was “fortified again” by the Hall’s board of directors, he said, in 2012. But before and in between, plenty of coaches who won less than 60 percent — 32 of them, to be exact — were inducted into the Hall. As recently as 2005, a “sub-60” exception was made to induct coach Willie Jeffries of Mississippi Valley State. Answer: You consider very few exceptions. But when a candidate has won 150-plus game, won a major national championship and earned legend’s status at three schools — you consider him. The issue here, though, goes beyond that 60 percent rule. It involves who is pushing Schnellenberger for induction and how. It happens to be the wrong people and the wrong way. A well-meaning group of supporters led by major FAU booster John Sasko has undertaken a letter-writing and media campaign to exert pressure to induct their guy. They even elicited a glowing letter of support from Don Shula sent May 18 to the Hall’s selection committee members. The trouble is, this effort, what Hatchell called “waging a campaign,” is rubbing wrong some of the very people who need to be convinced to make an exception for Schnellenberger. A better effort more likely to succeed would be one done through accepted channels, starting with an official nomination of Schnellenberger by a school. That’s a prerequisite, but neither UM, Louisville nor FAU has done this, perhaps because each knows of the 60 percent rule that would exclude him. FAU has nominated Schnellenberger for an Outstanding Contribution to Amateur Football award, which is more likely to happen but clearly would be a consolation prize to full Hall induction. Hatchell said the NFF and Hall would “review” their no-exceptions rule this fall. Meantime, the presidents or athletic directors of UM, Louisville or FAU — or all three — should formally and officially nominate Schnellenberger for induction and make clear the compelling reasons why he is deserving of an exception to their criteria. That is where the effort to give Schnellenberger his just reward must begin. That is the only way it might happen, and happen it should.